The hunt for an AIDS vaccine, a scientific quest that has stumped infectious disease researchers for two decades, is receiving a $100 million boost from a Massachusetts technology magnate, whose gift will create a Boston institute fusing the expertise of doctors, engineers, and biologists. Stunned by scenes of desperation he witnessed in HIV-ravaged South Africa, Phillip Terrence Ragon is spending a considerable chunk of his fortune to accelerate research for a vaccine that would slow the relentless spread of the virus that causes AIDS and now infects more than 33 million people worldwide. The money, $10 million a year for the next decade, will go to Massachusetts General Hospital but be shared with other research powerhouses, including Harvard University and the Massachusetts Institute of Technology. An announcement of the gift, the largest in Mass. General's history, is expected this morning from Ragon, 59, the founder and sole owner of InterSystems, a Cambridge company that provides database software to hospitals and other industries. 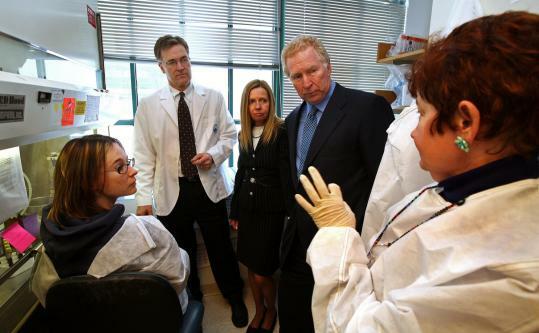 The AIDS vaccine research center is modeled on the Broad Institute in Cambridge, which explores the frontiers of genetic science, and, much like the Broad, will foster collaborations among specialists who do not usually spend much time talking to one another. By doing that - and by freeing scientists from the onerous pursuit of federal grants - Ragon, known as "Terry," said in an interview that he hopes to provide researchers the running room to chase concepts that might be dismissed by more risk-adverse donors. "You might say back in Newton's time, you could be a solo physicist conducting research," said Ragon, who has an undergraduate degree in physics from MIT. "But today, you need projects where large groups of people come together to focus on advancing the state of science." Since the dawn of the AIDS epidemic more than a quarter of a century ago, the formulation of a vaccine has loomed as the single greatest goal, and proved the most daunting failure, of HIV scientists. Leaders in the field predicted that the Phillip T. and Susan M. Ragon Institute - named for the technology entrepreneur and his wife, who are making the gift jointly - will help to reinvigorate an enterprise hit by crisis in 2007 when a vaccine trial by pharmaceutical giant Merck & Co. failed spectacularly. "This is exactly what the field needs," said Dr. Anthony S. Fauci, director of the National Institute of Allergy and Infectious Diseases, the federal agency leading the vaccine search. "There will be colleagues from MIT involved who think about these things from a very different perspective." The donation arrives at a propitious moment: With the economy reeling, institutions that rely on the generosity of philanthropists are watching wallets slam shut and endowments wither. "Hopefully, this will make a difference in the lives of millions of people with HIV and other infectious diseases," said Dr. Peter Slavin, president of Mass. General. "And I hope that it will inspire other people to remember the importance of philanthropy even in difficult economic times." The institute will be presided over by Dr. Bruce Walker, an enthusiastic AIDS researcher as comfortable in a tuxedo at a fund-raising gala as he is in the white-jacketed realm of the laboratory. By dint of his credibility as a scientist and his passion as a physician, Walker managed to convince Ragon that his money could make a difference in a field in which billions of dollars had already been spent. At the same time, Walker enlisted scientists who had figured that, given all the money and brain power already invested in the search for an AIDS vaccine, there was little they could contribute. Arup Chakraborty, a chemical engineer at MIT, recalled that he arrived to conversations with Walker beset by skepticism. " 'What would I add to it?' was my question," Chakraborty said. But he listened, hoping that his computers and mathematical equations could help further dissect the machinations of a virus that outfoxes vaccines by rapidly changing its genetic makeup and by hijacking its victims' immune system. Other MIT scientists will attempt to use tiny devices made of plastic, metals, or other materials - known as nanoparticles - to deliver vaccines with greater precision. "This was a problem that MIT couldn't walk away from," Chakraborty said. The scale of the challenge is sobering. With most other viruses, researchers have a clear window into what it would take to design an effective vaccine, learning valuable lessons from patients who become infected but manage to fight off the virus. "You get measles and you live or you die, and if you live you're immune to it for the rest of your life," said Dr. Seth Berkley, president of the International AIDS Vaccine Initiative, another consortium of scientists. "That's true for most diseases, but it's not true for HIV." Scientists such as Dr. Dan Barouch of Beth Israel Deaconess Medical Center are exploring a variety of approaches to stopping the AIDS virus. In some cases, they are trying to prime the immune system to better recognize the virus as an invader and stop it in its tracks. In other cases, they are working on vaccines that would detonate cells after the AIDS virus has taken them hostage. "The scientific challenges associated with making a safe and effective HIV vaccine are unprecedented," said Barouch, who is working with the Ragon Institute. Walker, affiliated with Mass. General and Harvard, heard of Ragon from a database salesman working for Ragon's company in South Africa, where the doctor conducts some of his vaccine research. One thing led to another, and Walker found himself sitting in Ragon's Cambridge office. The gregarious researcher set about discussing his work in South Africa, also inquiring whether Ragon's company would like to underwrite research. "I said, 'The best way for you to understand this is to come over and see it,' " Walker said. Two weeks later, in May 2007, Walker and Ragon were aboard a flight to South Africa. Once there, the tech company owner sat in an exam room with a doctor, each patient sicker than the one before. He'd seen privation before, as a teenager living in Colombia, where his father had been assigned by the Air Force. But what he saw that day, young adults preparing for death, moved him like nothing before. Ragon told Walker: "I don't see how anyone can see what I saw the last couple of days and not feel that they have to get involved." After several months, Ragon and his wife decided to create a research institute focused initially on research into an AIDS vaccine. More broadly, its mission is to harness the immune system to prevent and cure diseases. As both Ragon and Walker tell the story, it was Ragon who popped the question. "I went to talk to him about it, but he got caught up in telling me about the research," Ragon said. "Eventually, I said: 'Look, I'd like to spend this money. Let's talk about what we can do.' "